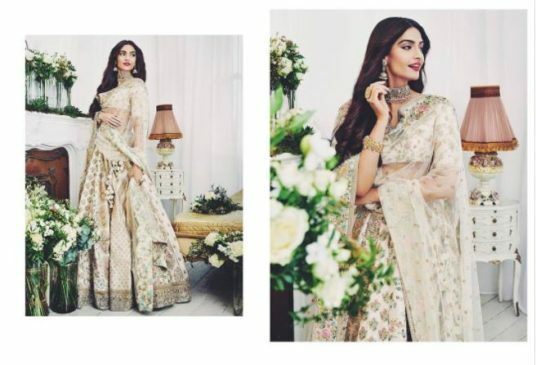 Sonam Kapoor, our favourite Bollywood fashionista doesn’t fail to impress us with her over-the-top and boss sense of style, which calls for her being a huge inspiration to your wedding shopping spree. There is something in store for everyone as she has the potential to rock any and everything. With her prodigious sense of style and fashion, Sonam continues to inspire people and challenge traditional fashion statements. 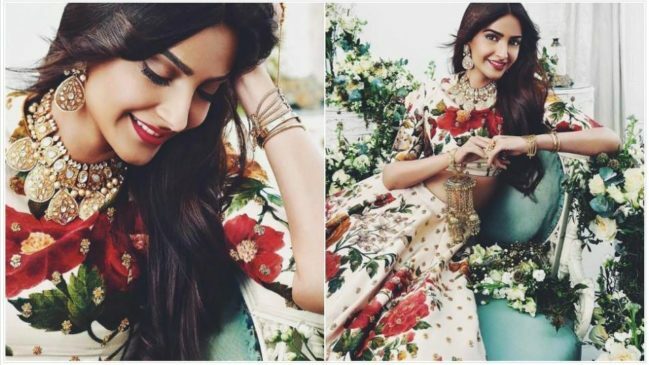 So if you are the bride or sister/friend/mother/acquaintance of the bride and groom, sit back and let Sonam Kapoor's fashion style inspire your wedding shopping. (Warning: This article is filled with gorgeous and surreal pieces of fabric which may temporarily sadden you and make you wish you could possess all of them right now and feel like a diva). 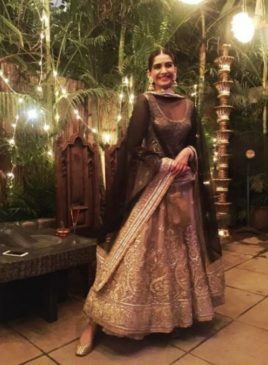 1) You know it’s going to be a flattering look when you combine Sabyasachi and Sonam Kapoor. 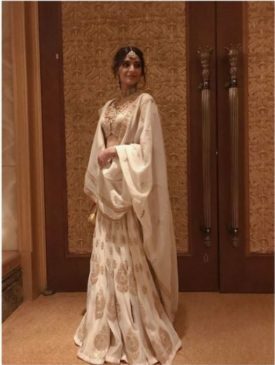 The precise detailing and handcrafted work with a lovely texture are commendable and so is Sonam Kapoor's fashion style with centre-parted hair and classic red lips. 2) This look of a beautiful Payal Singhal's lehenga with fish scale motif on the skirt is soothing to the eyes. Everything from the colour combination to the precision of the material to those gorgeous jhumkas (earrings) make this look impeccable. 1) Can glitter ever be wrong? (No, no, no) x 1000. Well, if it’s not overdone. 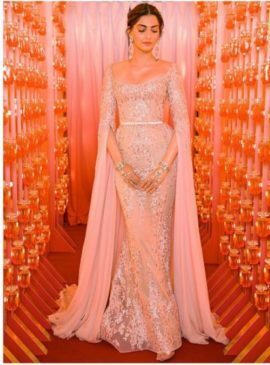 This absolute ace of a look by Elie Saab was worn by Sonam at Cannes’17. The plunging neckline and body-fitting fabric sealed together with a sleek gold belt looks nothing less than ravishing. Hmm, noted and acknowledged. Sonam graced an embellished chiffon dress, yet again, by Elie Saab and boasted off her curves and was successful, yet again, to charm us. She paired this stunner up with long matching earrings and hand accessories. This dress is the perfect inspiration for the bride’s cocktail attire. 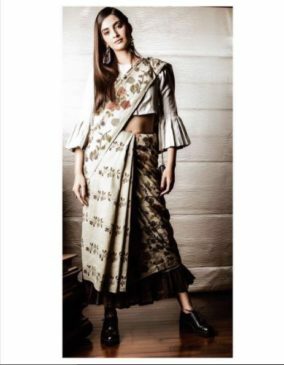 3) Anamika Khanna’s creations are as unique and stunning as it gets which is why it’s no surprise that Sonam Kapoor is seen rocking her work so many times. This look is stunning and is perfect for the friends and cousins of the bride/groom. Don’t forget to pair this look up with head and neck jewellery. 4) Lehenga with a stunning cape? Sign me right in. Carry out this look with minimalist jewellery as the dress speaks for itself and over-doing is what you do to ruin a perfect dress. 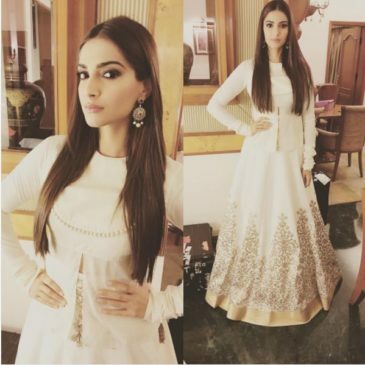 2) Rhea Kapoor in this Anamika Khanna piece of art looks like a diva! So many steal-worthy ideas here. Want a cool, breezy, bohemian sort of a fashion look and grab everyone’s attention? 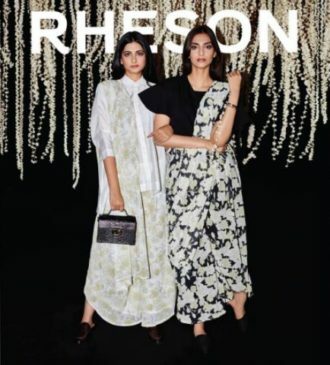 No worries, Sonam Kapoor's fashion style is here to help. Cool silhouettes and statement jewellery are all you need to keep in mind for a destination wedding and mehndi attire. Oh and also, Masaba Gupta, the one who designed this outfit, is love. 4) How gorgeous is this black and golden lehenga? This piece by Abu Jani and Sandeep Khosla is simple yet flawless and you can’t go wrong with choosing this for any ceremony you have to attend. 5) Say bye-bye to the traditional look that has become monotonous. We love this stylish saree by Anavila Misra because one, look at that classy blouse! And two, that colour combination! 6) Anamika Khanna again, yep! Because that’s how much she rules. That Dupatta and neck-piece are so gorg. 7) Rohit Bal’s creation is brought to justice by Sonam Kapoor's fashion style as she dolls up in it with Shruti Sushma's jewellery. Take note of the hairstyle and the earrings that go with this look like a grace. 8) Aww, look how adorable this look is. And guess by whom? That’s right, Anamika Khanna. Have a small wedding-related gathering to rush to? This is the perfect pick. 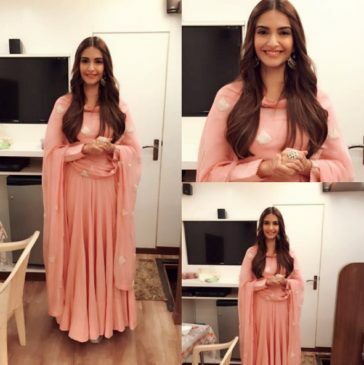 These were some of the steal-worthy dresses and ideas rocked by Sonam Kapoor's fashion style that we loved and we hope some of the looks made it to the album of screenshots on your phone. Most importantly, this article is to inspire your looks for the wedding functions in any little way possible; be it how to rock a palazzo saree or what order of gown would look extravagant. Let us know in the comments if any of the given pieces sparked your imagination or made wedding shopping a little easier. Cheers!